<base> element is used for the base URL for all relative documents in the HTML page. Only one base element is used inside the <head> element in HTML document. <base> tag supports Global attributes. <base> tag belongs to Metadata Content category. Here "http://www.wikitechy.com/" is a base URL. Click below to go Wikitechy tutorials. In the <base> tag “href=http://www.wikitechy.com/” is base URL for all the related URLs in the documents. <a href="online-tutorials"> this will be navigate to “http://www.wikitechy.com/online-tutorials”. If we cannot set the tag URL that will be navigate to the “online-tutorials” document in the current directory. Note: <base> tag is declare within the head element only. 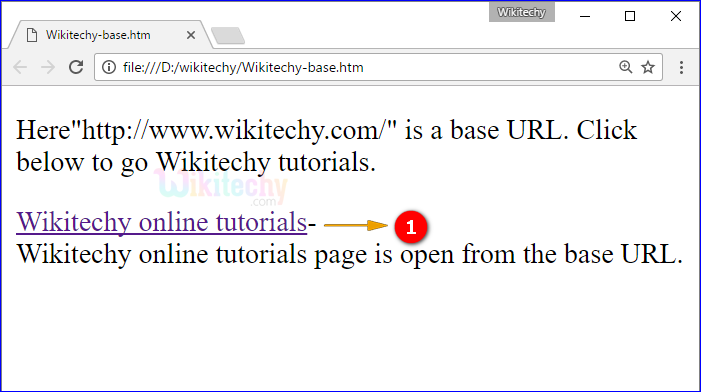 If user click the “Wikitechy online tutorials” link that will be redirected to Wikitechy online tutorials page in wikitechy.com website. The <base> tag is the first element inside the <head> element, so that other elements inside the head section uses the information from the <base> element. The <base> tag is present, it must have href or a target attribute, or both.